September 24th. As we breakfasted in the warm sunshine aboard Perla, it was difficult to believe that we were effectively pinned into the Milna marina by a coming storm – things were calm and all my weather apps were forecasting 25°, light showers and a moderate breeze. But Filip warned us, as we set out for our day visiting the highlights of Brač, that we might need rain jackets and warm clothing. As we left Perla the wind had risen a notch and there were clouds in the sky, but the sun still shone and it was hot. Our first port of call was Vidova Gora, a place we had hiked up to in the previous week. It was windy at the top and the visibility was even poorer than it had been the first time we were up there. This made it slightly difficult for Filip, who was trying to point out various islands and other things that we could have seen had it been clearer. He did explain the derivation of the name Vidova Gora, which has the same root as that of Saint Vitus (best known in the UK for his dance). St. Vitus is patron of many things, including dance and the arts for the northern Slavs, and of seeing, or vision, for southern Slavs – hence the name for this, the highest peak (or “penk” as the sign has it) in the Adriatic islands. Our next stop was in a small town called “Pučišca”. In Croatian, the č is pronounced “ch” as is “cheese”; the š as “sh” and the c as “ts”. So good luck with getting the pronunciation of this town right. Apparently many of the locals can’t. and its claim to fame is that it has a stonemasonry school (“Klesarska škola” in Croatian). Since Brač is famous for its white limestone (to be found in Diocletian’s Palace in Split, bits of St. Mark’s square in Venice and other notable places, although not, probably, the White House), it’s good to see that investment is being made to maintain and develop the skills of working it. Our time there was sadly short, as it is an interesting place to visit. We had an explanatory description and a bit of a technique demonstration from a professor at the school, Siniša Martinić, against a background of the students hammering and chiseling away. Here is a link to some video clips of the place. If reproducing a complex shape, a kind of 3D manual pantograph arrangement is used. The shape to be reproduced is in the foreground, and the odd-looking frame in the background is used to measure specific dimensions to ensure correct reproduction. and some is from deeper and has fewer fossils visible. Everything done at the school is done by hand – no machinery or power tools. If polishing is needed, the process is done by hand, using eight successively finer diamond pads, like the ones shown here. And, as we ran for a cafe, we realised that the gusts were really very strong – outside tables and chairs were going flying and awnings were in danger of being ripped apart. The cafe we got to had a really tough time with ladders and rope to secure their awning. I would have videoed it, but that seemed a bit ghoulish, so I just drank their coffee instead. After our coffee break, the script called for us to visit a place called Škrip, where there was a historical and archeological museum and also an olive oil museum, which sounds a bit niche. On the way, we could clearly see from our minibus how the wind was whipping up the waves, and how sensible had been the decision of our gulet captain to stay put for the day, rather than strike out for a different destination. The wind is my introduction to the word “katabatic”. The locals call it “bura” or “bora” and it is caused by the clash of continental and adriatic weather systems. A major characteristic is strong gusts rather than simple raw wind speed, and what we experienced was actually quite light – 200 kph gusts have been registered in the past, apparently. while a second was a reproduction of one of the earliest recorded instances of the cyrillic script used on the island. Andrea was a real story-teller and covered many of the aspects of society as it developed on the island, with too much detail to record here. And then it was time to go and meet another charming hostess, called Dora, who looked after us as we went to the olive oil museum round the corner. An olive oil museum sounds rather niche, and it is in fact quite a small place – but they gave us a nice lunch (I have a photograph of the spread of tapenades, prosciutto, bread, local cheese, tomatoes from their garden, marinaded olives, locally baked bread and fig jam, but my religious principles forbid me from sharing it, of course). After lunch, Dora explained how the process of making olive oil used to work, with a huge old wooden mill to create a paste from the olives and an impressively large press to extract the oil from the paste (which was put in rope baskets to filter out much of the remaining bits). Cold water was used at first, but still there was oil in the paste, so a second pressing used to be done with hot water, resulting in oil which was edible but not very nice. To get the last knockings out of the paste, boiling water was used, and the result was inedible, but could be used in, for example, oil lamps. So “cold-pressed” was the good oil, and you’ll see that on many an olive oil label these days. But all the olive oil one buys today is electrically extracted and with cold water, so it’s all cold-pressed. If it says it on the label, it’s because the marketing department put it there, and is nothing to do with the basic quality of the oil – the key phrase is “virgin” which (according to Dora at least) refers to oil produced no more than 24 hours after picking. One of the recurring themes of our travels in Croatia is the presence of locally-produced liqueur wherever we have gone. The olive oil museum was no exception, and produced a sour cherry liqueur for us to taste which was very nice but not significantly better than others we had tried. 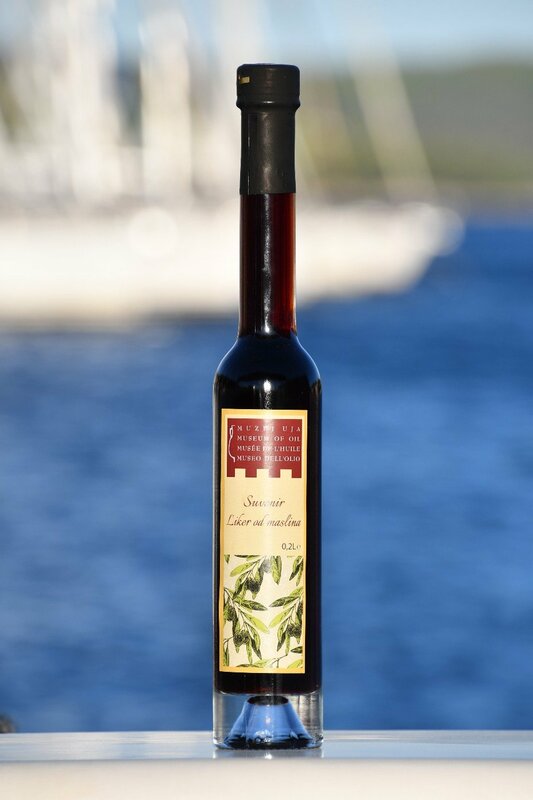 But they also produced an olive liqueur, which was strikingly different… in a good way… so we now have two bottles of Croatian liqueur to take home – cornelian cherry and olive. Our New Year celebrations will be considerably enriched, I think. We will stay on Brač tomorrow, so stay tuned to see what we get up to. For now, good night!